Undergraduate and graduate students and practitioners in biomedical engineering, life and biological sciences, materials, mechanical and engineering sciences, and medicine. Introduction: what are biomimetic materials? What Clinically Useful Information has been Learned from Implant Retrieval and Analysis? Summary: What does Postmarketing Surveillance Teach Us? Professor Hoffman studied at M.I.T., where he received B.S., M.S., and Sc.D. degrees in Chemical Engineering between 1953 and 1957. He taught on the faculty of M.I.T. Chemical Engineering Department for a total of ten years. He also spent four years in industry. Since 1970 he has been Professor of Bioengineering at the University of Washington in Seattle, Washington. Professor Hoffman has over 330 publications, several books and chapters, 21 patents and several other patents pending. He is on the Editorial Boards of seven scientific journals. Summary of professional activities and awards include: •President, Society for Biomaterials, 1983-1984 •Clemson Award in Biomaterials, 1984 •Board of Governors, Controlled Release Society, 1991-1994 •Biomaterials Science Prize, Japanese Biomaterials Society, 1990 •Founders’ Award of the Society for Biomaterials, 2000 •Election to the National Academy of Engineering, 2005 In December, 1992, Hoffman's colleagues organized a symposium in Maui, Hawaii in honor of his 60th birthday. In December, 2002 his 70th birthday was celebrated at another special symposium, once again in Maui, Hawaii. 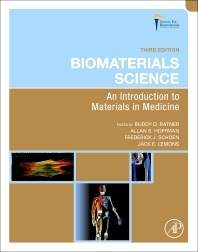 Papers from the first symposium were published in the Journal of Biomaterials Science (Polymer Edition), along with a Festschrift book, and similar publications are in press at this time from the second symposium.